Senior foilist Dayana Sarkisova competes during the NU Duals. 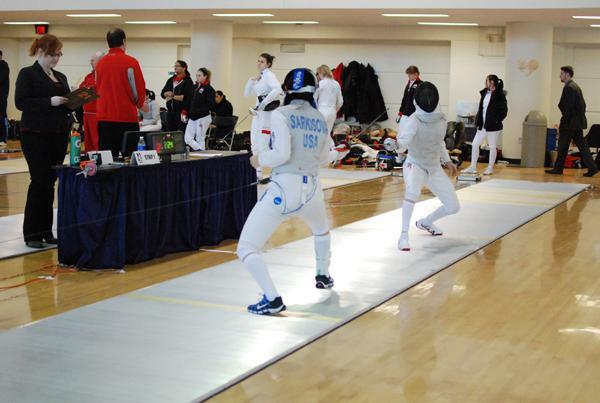 The Wildcats will participate in the USA Fencing Junior Championships this weekend. Until last weekend, the Wildcats had experienced a relatively steady season, beating the opponents they were supposed to beat but lacking what senior Chloe Grainger called a “signature win.” With a victory over Penn State, Northwestern scored its first upset win of the season Sunday, but it was preceded by an uncharacteristic loss at the hands of Duke. Back on their own again this weekend, eight of the team’s freshmen, as well as sophomore Courtney Dumas, will head to the Junior Olympic Championships to compete for individual as well as team titles before gearing up for the Cats’ final regular season event at the Notre Dame Duals the following week. At the qualifying event in December, NU swept in all three weapons with freshmen Haley Hart, Mikela Goldstein and Cara Franke winning the epee, foil and sabre events, respectively. The season has taken its toll on the Cats, and the team heads into the weekend with some nagging injuries. In addition to competing in their individual events, the Cats will team up to form two epee teams and one foil team that will represent NU in the junior squad competition. Freshmen Jen Yamin is the highest NU seed in the foil event at No. 10 while Dumas will be the most highly favored of all her teammates with a seventh seed in the epee competition. Dumas was a member of the bronze medal epee squad last year and notched an eighth place finish in individual competition.